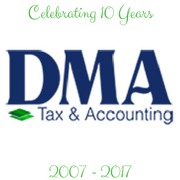 The DMA Tax & Accounting team works with numbers everyday, but when our staff recently realized we are officially celebrating 10 years as DMA this month, it made us sit back and think about what it means to be able to serve our clients for that amount of time. “Great customers and great employees are most important to the success of a business. Treat both well, and you will have long-term loyalty from both,” Blair says. DMA is using the strength of the past to push toward more future success. If you would like to experience what DMA has to offer your business, contact them today.